(Lowell, MA) There has been a move in recent years to use film and stage to unearth the hidden stories of women who have advanced society while making their contributions in the confines of sexism. This has resulted in a series of earnest biopics or bio-plays, some more well-crafted than others. I have seen few as successful as “Silent Sky” at showing how a woman must find a way to navigate a “man’s world” while trying to juggle the pull of family. While the script and this production sometimes gloss over the hard edges of the story for the sake of wistfulness, they combine to create a character portrait of a woman who transcends the domestic sphere to unlock secrets of the cosmos. 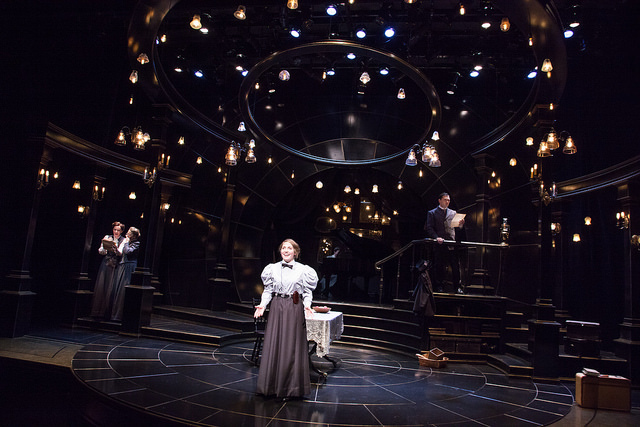 Henrietta Leavitt (Alexis Bronkovic) is never a perfect fit at home. When her sister Margaret (Victoria Grace) needs her in the kitchen or to help at her father’s church, Henrietta can often be found outside pondering the night sky. College educated, Henrietta secures what she thinks is an astronomy position at Harvard, only to discover she is to be one of a small team of unheralded female mathematicians who do the grunt computation for the male astronomers to utilize for theories on the universe. Rather than shrinking from this disappointment, Henrietta dedicates herself to the job, winning over the team and finding a way to do groundbreaking work. As she does so, she pulls away from Margaret and her family just as they need her. This production is well paced and full of heart, and aided by an exquisite yet understated set design that encompasses both the warm wooden feel of home and the stardust that dazzles in Henrietta’s eyes. Director Sean Daniels’ pacing and Brokovic’s confident choices on stage allow Henrietta to materialize slowly before our eyes, so that she seems like a familiar friend at the end of the show. There are many threads to this script that could also have become just as deeply defined, including the push and pull between Henrietta and her sister and the love affair between Henrietta and a fellow astronomer; if they had developed, this show could have been elevated from a winsome delight to an unforgettable classic. However, it would be a challenge not to see this play and not leave feeling uplifted and full of wonder, and for this, the creative team deserves congratulations. This entry was posted in Uncategorized and tagged 2017, Alexis Bronkovic, Craig Idlebrook, Julia Brothers, Lauren Gunderson, Lowell, MA, Meghan Moore, Merrimack Repertory Theatre, November, October, Polly Lee, Sean Daniels, Silent Sky, Tom Coiner, Victoria Grace by craigidlebrook. Bookmark the permalink.